Unparalleled quality and top-line performance for home theater audio equipment. Ultra-flexible rubberized PVC jacket. Shielded RCA patch cord. PVC jacket. Fully molded construction. High-retention RCA plugs. Shielded RCA patch cord. 26 AWG Stranded Copper Center Conductor. Color-Coded Red-White/Red-White or Black-Black. PVC jacket. High-retention gold RCA plugs. Color-coded red-white to red-white. Fully Molded 24K Gold-Plated RCA Plugs. Ideal for connecting two RCA devices. Fully molded design provides maximum durability and excellent signal transmission. Ideal for extending your existing RCA cable. Fully molded design provides maximum durability and excellent signal transmission. RCA cables are mostly used in many consumer electronics such as, DVD players, VCR, Game consoles, Home theater, music players, projectors and TV. We at SF Cable offer a wide suite of RCA Cables online. 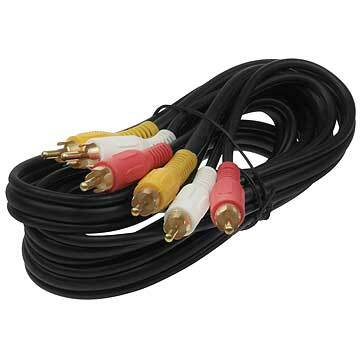 RCA Cables are used to transmit audio - video between your TV projectors, audio system or home theater. Explore a wide selection of RCA audio video shielded cables, shielded audio video composite cables and many others. We offer high quality RCA cables at the wholesale prices on internet. We also provide lifetime technical support and extended warranty help on these cables. Buy any cable with confidence from SF Cable. We sell high quality cables and other products at discounted prices.